I can’t believe it’s already March, and it’s even harder to believe that my time here in India is half over. Even weirder, that I’ve been in India for a little over 2 months. I have mixed feelings about this trip being half over…but first, an update on what’s been going on the past week. I had a fabulous weekend! 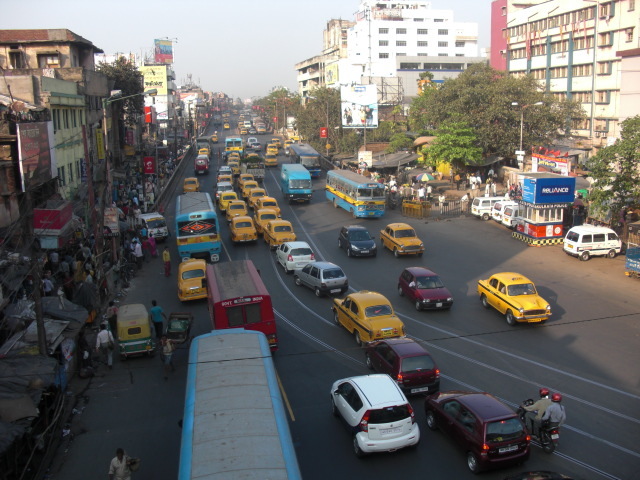 We didn’t have class on Friday, so we took advantage of the day off to explore more of Kolkata. For the first time since I arrived in India, plans were made and they actually happened!! It’s a miracle. We started off the day with going to Tagore’s house here in Kolkata – we all met at the metro (around the same time, and everyone was there! That’s a huge accomplishment in itself) and then walked to his house. His house is now a museum, with lots of art galleries and photos of Tagore. There were a lot of artifacts and quotes, and it was just okay. I still don’t understand why people are so obsessed with Tagore here, but then again, I haven’t read any of his work yet. For now, it sounds like most descriptions of him or his work are very melodramatic. We were all pretty hungry afterward, and headed back to Park Street for a delicious lunch – chelo kebabs at Peter Kat :) We had a little time after lunch before we had to be home for yoga, so we went to the Mother House – Mother Teresa’s Missionaries of Charity. It was incredible! Mother Teresa’s tomb is there, and I can’t believe I visited the tomb of someone who is in the process of becoming a saint! There was a really nice exhibit as well, which had lots of information about her life and many of her things like her sandals, letters she wrote, her Nobel peace prize, her wheelchair, and more. She had an amazing life, and I don’t know how you can know you’re life’s calling when you’re 18 and follow it to the fullest. I really respect people who devote their life to God to live in an order or monastery, because I could not live that lifestyle! We also saw her bedroom – a tiny austere room, and they said she never used a fan even though her room was directly above the kitchen (not to mention the Kolkata heat)! Turns out we were there during the time they give weekly Mass, so of course we had to stay for that. 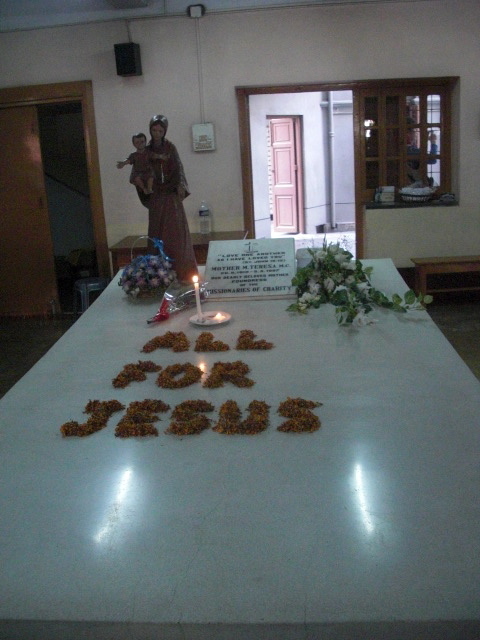 Can’t believe I had Mass with Mother Teresa’s tomb right in front of me! We made it home in time for a great yoga class. I really love yoga. It’s great to take the time to relax and meditate, and I feel like we never make time for that at home with our always-on-the-go lifestyle. It’s no wonder yoga was invented here – they need it to cope with the craziness that is India! After yoga, we had dinner out at a nearby restaurant, Mirch Masala, and had some drinks at a nearby bar. It was a great time and so nice to be out! We had another big day on Saturday – starting off with visiting the Botanical Gardens. 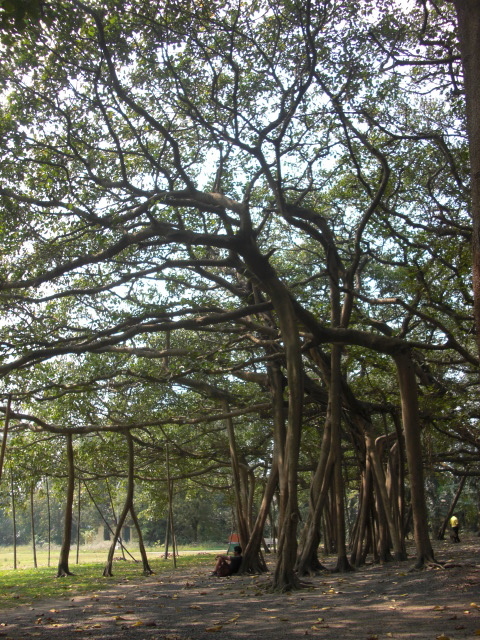 It took a long time to get there (about 1-1.5 hours), but it was great to see the famous Great Banyan Tree. This tree is incredible – it’s basically a forest, yet it’s all one tree. It’s 250 years old and has been in the Guinness Book of World Records! It takes up over a kilometer of space. We had a really long bus ride and metro ride to go to Danny and Michael’s house afterward, and by the time we had lunch and reached their house, it was already 5pm. So much time is lost in transit here!! We watched a great Bollywood movie, called 3 Idiots. It’s was a really long movie, full of slapstick humor and song and dance. You have to suspend the laws of reality and probability and embrace the cheesiness – but I liked it :) We spent Sunday relaxing and recovering after such a busy weekend. It sounds like we didn’t do that much since we only did 2 things each day, but it just takes so much time and effort to get anywhere – it’s exhausting! This week has been pretty good so far – just class and getting some work done. I met a new friend in class, and Loreto is slowly getting better. The past few times I’ve visited, I’ve spent time just sitting and talking to the girls since it wasn’t tutoring time and I’ve enjoyed that a lot more. When I went today, more of them remembered me and were happy to see me, which is a great feeling :) These girls need so much attention, which is really obvious when they turn my face back to them if I look away for even a second. And this time, the girls asked my help for some homework so I felt helpful for once! So…I’m halfway through my time here in India. I’m not sure how I feel about it, because my feelings change each day. I feel like I’m barely adjusted to living here. Sometimes I think I’m doing really well and I feel well-adjusted to living here, and then something will happen that will throw me off again. It’s very confusing – I go back and forth all the time between enjoying it here and wishing I was home. Sometimes I’m not even sure if I like India, and sometimes I have to remind myself why I even came here in the first place. There’s so much of India that I don’t understand. I feel like I still have a lot to learn, and I know I’m only just barely scratching the surface, even though I’m here for 4 months. Now that I’ve realized I have a little less than 70 days left here, I’m torn between being excited to be home soon and being panicked that I have such a short amount of time left and that I should be seizing every day every moment. I think about home a lot here…it’s partially a coping strategy for India and partially a negative distraction from what I’m doing here. I know the time will pass quickly and sometime in the future I will miss my time here. That’s exactly how France was, which brings in a whole other element to this. It was only 3 months ago that I was still in France. I’m not even sure what I’ve learned and taken away from France yet since I’ve barely had any time to process it. It feels like that was a dream – the reality that France is over still hasn’t really sunk in. I was organizing France pictures the other day, and I can’t believe that it’s already over and it’s all just memories now. I keep trying to compare this experience my experiences in France, which often doesn’t work very well since this is a completely different situation. I miss France already. My life is a constant transition, which is equally exciting and exhausting. India is often so draining, so I find myself often thinking about home and wishing I was back there with the stability and predictability and people I love. I think I’m just feeling study abroad-ed out, or a little travel weary. I knew it was going to be crazy and I wanted this kind of challenge and I knew what I was getting into, but at the same time I had no idea what I was getting into and that I might be biting off more than I can chew. For a long time, I thought being homesick and thinking about all the good things I have waiting for me at home was a bad thing. But now, I need to not be not be so hard on myself – give myself a break after being away from home for what will be almost 9 months straight. For now, let the roller coaster continue.